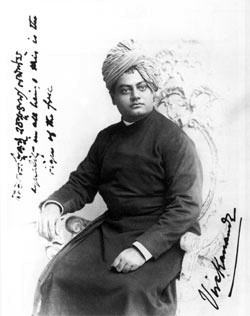 Addresses at the Parliament of Religions by Swami Vivekananda - Frank Parlato Jr.
My thanks to those noble souls whose large hearts and love of truth first dreamed this wonderful dream and then realised it. My thanks to the shower of liberal sentiments that has overflowed this platform. My thanks to this enlightened audience for their uniform kindness to me and for their appreciation of every thought that tends to smooth the friction of religions. A few jarring notes were heard from time to time in this harmony. My special thanks to them, for they have, by their striking contrast, made general harmony the sweeter. Much has been said of the common ground of religious unity. I am not going just now to venture my own theory. But if any one here hopes that this unity will come by the triumph of any one of the religions and the destruction of the other, to him I say, "Brother, yours is an impossible hope." Do I wish that the Christian would become Hindu? God forbid. Do I wish that the Hindu or Buddhist would become Christian? God forbid. The seed is put in the ground, and earth and air and water are placed around it. Does the seed become the earth, or the air, or the water? No. It becomes a plant, it develops after the law of its own growth, assimilates the air, the earth, and the water, converts them into plant substance, and grows into a plant. If the Parliament of Religions has shown anything to the world it is this: It has proved to the world that holiness, purity and charity are not the exclusive possessions of any church in the world, and that every system has produced men and women of the most exalted character. In the face of this evidence, if anybody dreams of the exclusive survival of his own religion and the destruction of the others, I pity him from the bottom of my heart, and point out to him that upon the banner of every religion will soon be written, in spite of resistance: "Help and not Fight," "Assimilation and not Destruction," "Harmony and Peace and not Dissension."